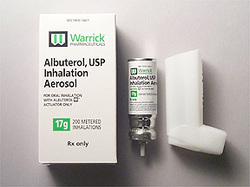 Beta 2 receptor agonist may include albuterol, salmeterol, terbutaline and ritodrine. Beta 2 agonists are useful in treating asthma ( long term asthma attack or prevention of asthmatic attacks- such as albuterol or salmeterol) and to reduce contractions of the uterus during the preterm labor ( terbutaline and ritodrine). Salmeterol / albuterol will stimulate the beta 2 receptors of the respiratory smooth muscle which finally lead to bronchodilation. The common side effects are anxiety, tremor and tachycardia.